Are laptops a back-to-school necessity for American students? 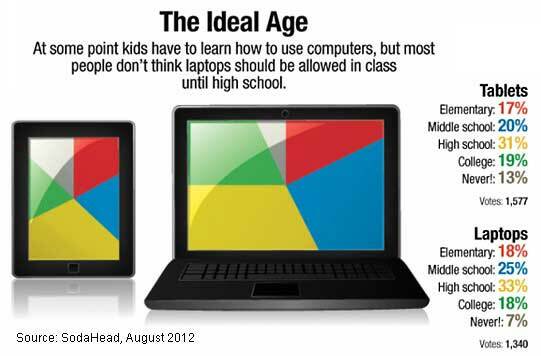 Not until high school, according to a new poll from SodaHead: A plurality (33%) of Americans say laptops should be allowed into classrooms when students reach high school, 25% say it's OK for laptops to be used in middle school, and 18% say laptops should be allowed in class when students reach elementary school. Similarly, 17% of Americans are OK if kids use tablets in elementary school, 20% say kids should wait until middle school to use tablets, and 31% say high school is the right setting to introduce tablets in the classroom. Some 13% say it's not appropriate for tablets to be used in class. Below, other findings from SodaHead.